The Cannabis industry is experiencing significant growth. As it becomes legal recreationally and medically across the United States spending on cannabis is expected to go from 9.7 billion in 2017 to 47.3 billion in 2027 (from Forbes). As a result cannabis dispensaries (locations where it is legal to purchase cannabis) are going to continue popping up in cities across America in greater numbers. No dispensary is alike but what most have in common is the need to display cannabis that is appealing, secure and versatile. Jahabow has been making display cases for over 40 years and we have multiple options (both custom and standard sizes) that will work great inside a cannabis dispensary. 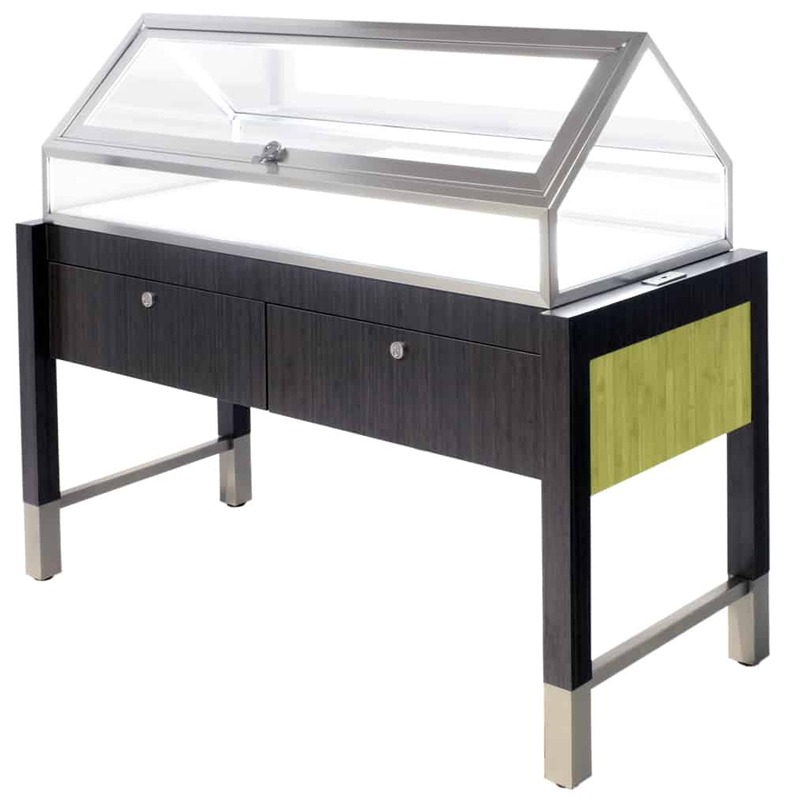 Our new Greenhouse Display Case has a unique “greenhouse” design with a premium finish that attracts customers. This display case also features LED floor lights that light the product from underneath (no heat output) to display it beautifully. Locking, swinging hinge door allows for easy retrieval of product for customers to sample. The TDL Series of Secure Display Cases are all about security. With a TDL case you can be sure that you will reduce loss and safeguard your most valuable inventory in this case cannabis, glassware, oils etc. How do we do this? We start with the glass. In a TDL display case we use a combination of polycarbonate, hurricane glass and safety glass to prevent intrusion. Then we move to the frame which is a one-piece aluminum extrusion that adds significant strength. The doors are also reinforced to prevent prying. We also offer Wall Display Cases and Extra Vision Display Cases. They both feature premium tempered glass and LED lighting incorporated into the frame. The extra vision display cases feature three tiered glass shelves and multiple door options including: glass, mirrored and paneled. The Wall Display Cases feature storage as well as glass shelves. These are both ideal units for glassware, oils and accessories. We carry a variety of standard sizes and we can also build to any custom specification. Contact us today for a quote or consultation.